Buy Witchy Words a Coffee. ko-fi.com/witchywords - Ko-fi ❤️ Where creators get paid by fans, with a 'Buy Me a Coffee' button. 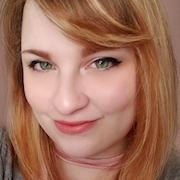 Marietta is the author behind Witchy Words: A Witchcraft Blog and is also on staff as a writer/editor at A Center Spiral Magazine. Her blog focuses on her journey with her familiars and connected spirits, presenting rituals, altars and spells while exploring witchcraft theory and history. Marietta lives with her husband and 4 familiars while working as a caricature artist in Kansas City. Ko-Fi is a tip jar for creators! If my work has helped you and you'd like to give back, consider supporting me with a cup of coffee. Every bit helps and goes back to the blog. Thank you so much! Secured Payments. Support goes to Witchy Words's account.